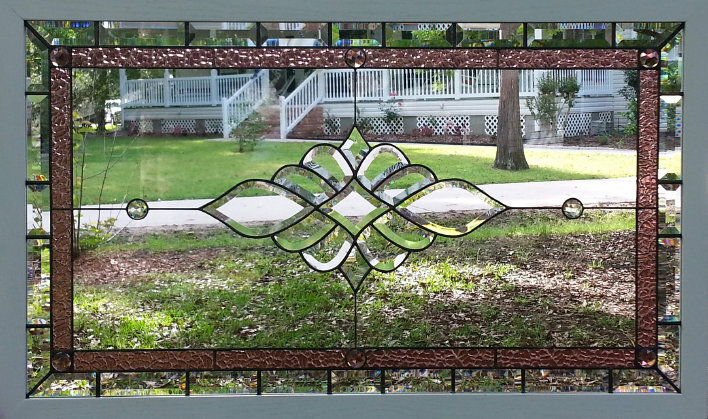 I built a transom for Joe, Martha's husband, for their beautiful home on Santa Rosa Island in nearby Pensacola Beach. They live close enough that I was actually able to meet them, and later install their window. I get to work with such nice people! Martha's Window measures about 24" x 40", contains 65 pieces of glass and was completed in June, 2016. It is framed in a 1x2 red oak frame painted white to match adjacent woodwork. Martha's window was designed to hang in front of an existing roll-out casement window. In this way the window can be opened to enjoy the breeze from the Gulf of Mexico. After installing Joe's transom (above), Martha pointed out her kitchen window as our next project. 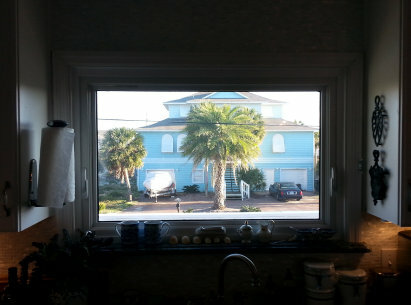 Her window, pictured below, looks out toward the beach and the local community. 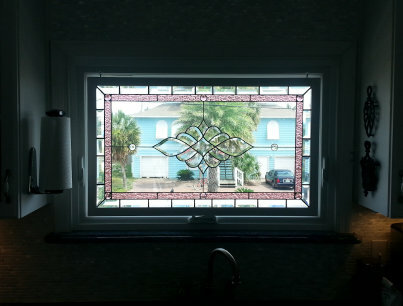 She wanted a decorative window with just a touch of color and lots of clear glass for greater outside visibility. She chose a really interesting textured light purple glass to add a little color to her window. Her kitchen faces the sun most of the day so Martha decided on a beveled border, a 13 piece central bevel cluster and 8 jewels. All the bevels & jewels will be magnificent in the sun and should create lots of little rainbows.